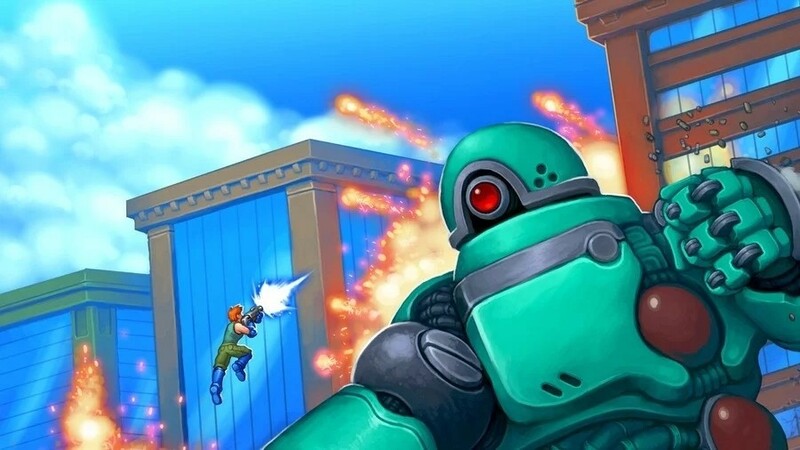 In February, Gunman Clive developer Bertil Hörberg announced his new platform action title Mechstermination Force would be arriving on the Switch eShop this Spring. It's described as a cross between the Contra series and Shadow of the Colossus on PlayStation 2, and will apparently be "a lot bigger" than his previous releases. Speaking to Destructoid last week at the 2019 Game Developers Conference, Hörberg voiced his concerns about his new game's launch now that Cuphead has been announced for the Switch. Although these titles aren't the same type of game, he's worried how it might impact his own release. "I'm excited and terrified of the launch. We'll see what happens basically and I have to admit, it's not the perfect timing with Cuphead being announced. They're not the same game, but they are similar and being released so close together is not ideal." In Mechstermination Force, you take control of a small group of soldiers who are fighting to save the world from gigantic mechs. You'll need to use powerful weapons and upgrades as you jump and climb all over them to find their weak spots and blow them to kingdom come. You'll also be able to team up with a friend for some classic co-op action. 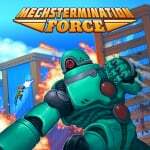 According to an eShop listing, Mechstermination Force arrives on 4th April in both Europe and North America. Cuphead by StudioMDHR arrives a few weeks later on 18th April. Are you interested in Mechstermination Force? How about Cuphead? Tell us down in the comments. This game looks awesome. I'll buy it for ya, Bertil. I already own Cuphead on PC. I'm definitely grabbing Mechstermination force! I wouldn’t worry too much about it. This game looks awesome, and I think it’s different enough in both style and substance to set itself apart from Cuphead. And given how difficult Cuphead is, I think this game has the potential to appeal to people that will never be drawn to Cuphead. He might be right to worry a little bit: until this article I forgot about this game entirely since Cuphead was announced. Both Mechstermination and Katana Zero are in grave danger of Cuphead. Yes they're both quite different, but releasing so close to such a juggernaut like Cuphead is definitely going to hurt their visibility. Regardless I'm quite interested in them all and I'll be sure to give each of them the attention they deserve! Nope, I'll be getting this and waiting for a physical copy of Cuphead (plus I already have it on PC). Not really interested in cuphead but this game looks awesome. Mechstermination is a new game, plus it's drawing influence from one of the greatest games of all time, SOTC. Cuphead will make waves, but for me personally, I'm more excited for this. Funny, this game popped into my head when watching the Cuphead trailer yesterday. I hadn't thought about the 2 being similar before. I'll be getting both for sure ,love the look of Mechstermation Force. I don’t think he has anything to worry about. See when I first saw this game the first thing that came to mind was Cuphead, I even mention it on the comment as well. I can see why the Gunman Clive dev is worried but I say release it anyways and see the result. Even if it doesn't live up to expectation, at the very least they'll be room for improvement with a sequel. This game looks surprisingly good! I'll have to keep an eye on this one! Don't worry, some of us will wait for Cuphead physical. And here I'm still waiting for a release date for Blazing Chrome. Hadn’t seen the trailer yet, till now, but I’m adding to the wish list. @NImH he was trying to express himself. He’s queer. It wasn’t about sensationalism. I'll get both for sure. Hörberg is good people and I'd be there no matter when he launched it. I'll always make time for your games, Bertil! Make sure to hold a sale at different times to Cuphead. Maybe even offer a sale if you pre order it or something. I think it looks great and I'll be getting it! Is it basically just like a boss rush type of game or are there platforming levels aswell? Something to consider. If I play a game and really enjoy it, more often than not I then look for more games like it to play. So while cuphead may take away some sales, it may also add some. I care much more for this game than for Cuphead. I will buy this on launch. looks awesome! and buy cuphead physical later on. I getting both day 1. I loved gunman Clive and can’t wait for his next one. Cuphead I played 1 time the other day and it’s a different beast even though they may seem similar. You get to have Clive as a playable character in Mechstermination Force? So I'm the only one that finds that trailer a bit boring and repetitive looking...? Still need to see how this turns out but so far looks really good! The price point should alleviate any concerns. This is $12 in NA. Cuphead is $20. Enthsiasts for big boss battles (I am one!) get an embarrassment of riches at a cheap price. The art and animation in Cuphead was beautiful, but the repetitive TRY AGAIN nature of it just made me sick of it. It took the joy out of the game. Boss fights are great at the end of a level, but the stress of a game that is 95% bossfights is just not enjoyable. I'm a sucker for most side scrolling games anyway so I'm likely going to get both. But the concerns are certainly valid. I understand what he means, as those few extra sales of people who choose Cuphead over his game would be potential sales for him. But I feel his game is more than different enough to make the money that it's going to make anyway. I don't think he should worry too much. Hörberg is gonna have a two week head start. I'd be more concerned if it released after or on the same day as Cuphead. Hah, that typo first had me read "Granma Clive" and then on re-read "Guv'na Clive", until I slowed down enough! I want to support good ol' Bertil Horberg whenever I get the chance to do so. Hopefully this April won't get any crazier - having already bought the Fighters Pass helps a fair deal. @NImH this is a really disgusting attitude. Grow up and meet some interesting people, or stop consuming culture if you don't wanna get a look into a perspective different from your own. Ugh. I hope you're either joking (in which case, be smart AND funny next time) or somehow misspoke. I'm pretty sure the developer is queer so there's no way his gesture was anything but sincere. I'm definitely grabbing Mechstermination force as well as Cuphead! I really like Horberg Productions' games and felt like they were vastly underrated on the 3ds. (I mean Jools games got near constant coverage on this site but it felt like Gunman Clive went under the radar). Definitely will have my support day 1. I completely understand why Bertil is a bit worried but at the very least I can do my part. Believe in yourself Bertil! @NImH being shocked that you would label queer inclusion as a marketing ploy and not for the excellent, surprising, heartfelt gesture it was isn't toxic. It's sincere and human. Your comment absolutely read as a slight, so was it? Be real or take your games back to 8chan. You have a good one mate. Overall, Cuphead is more my style, but I already have that on PC. This game looks nicely designed as the various boss attacks seem quite clever. The style of Shadow of the Colossus is clear in how the boss fights are laid out and should differentiate it from Cuphead. The music in the trailer was not quite to my taste for a game like this. I don't know if that is representative of the in-game music. That's something I'd want to investigate further after the release. But it looks very good and I wish him luck with the game. The more the merrier. Hollow Knight wht my appetite for Dead Cells, Into The Breach for Wargroove... I think similar kinds of games can boost the attention towards them. Nail that pricing too! This game looks great I hope for the best can't wait to have a go at it . Surprisingly I have no interest in Cuphead I've heard some good things but it just doesn't catch my attention. Though I truly believe the Switch has a healthy enough base at this point that both titles will do just fine. I loved the Gunman Clive games, And this looks pretty fun too. A definite buy for me. I wouldn't even put it past Mr. Hörberg to do something like that! The game looks like it can stand on its own. I am sure many will buy it (I'll buy it someday too, if the reviews are good).